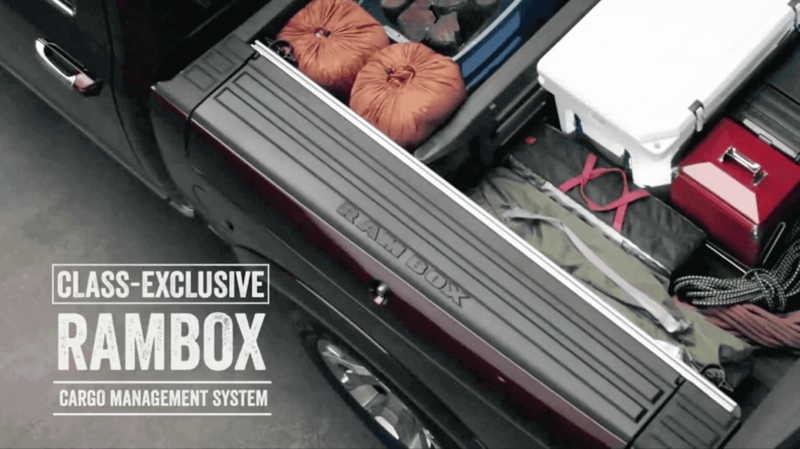 The class-exclusive RamBox® Cargo Management System is more than just a tool box! It features a lit, secure/lockable, durable and drainable storage system incorporated into the side rails of the truck tub. The AllSecure® remote security system allows remote locking and unlocking of the RamBox®, as well as the rest of your RAM Truck with the push of a button. RamBox® vehicles come equipped with a cargo bed extender/divider, cargo bed rails with four adjustable tie-down cleats, as well as cargo box lighting. The adjustable and lockable bed divider/bed extender fits on the lowered tailgate and adds 60cm of additional length to secure longer loads. The bed divider creates individual compartments in the tub bed to separate equipment and keep it secure. The cargo rail system on both sides of the tub bed has sliding, adjustable cleats for infinitely adjustable tie down versatility. Drain holes inside the RamBoxes allow this space to be used as cool storage with ice and space for up to 140 drink cans on either side. The water resistant/weatherproof and lockable RamBoxes keep items safe and dry. 152cm long, the RamBox provides 243 litres of storage space on both sides of the tub making them large enough to hold items like golf clubs, helmets, tool boxes, chainsaws, fishing rods and so on..